Van Diemen's Island or Tasmania. 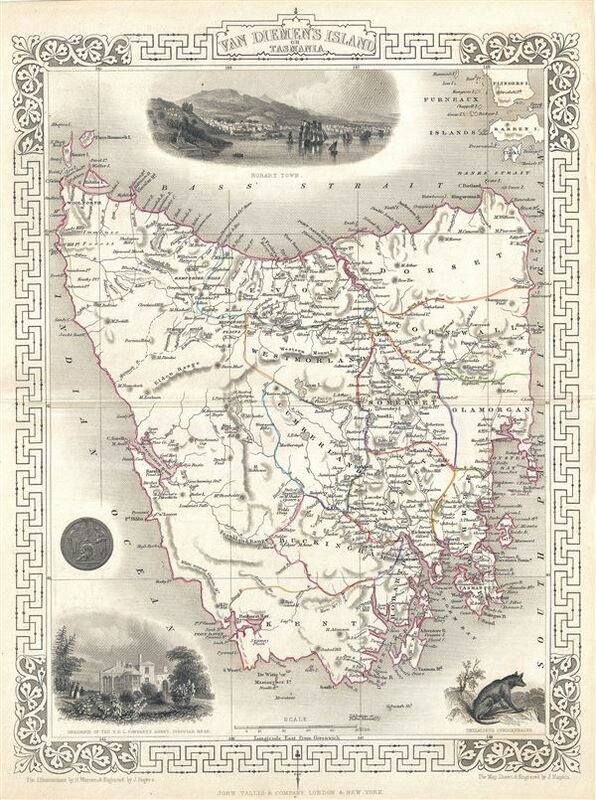 This is an impressive 1851 Tallis map of Van Diemen's Island or Tasmania. The map covers the entire island of Tasmania in considerable detail noting towns, lakes, mountain ranges and other topographical features. Van Diemen's Land was colonized by the British as a Penal Colony under the name 'Van Diemen's Land,' referring to the Dutch East India Company governor who sponsored Tasman's historic 1642 discovery of the island. In 1856, five years after this map was issued, Van Diemen's Land would be granted responsible self-government and renamed 'Tasmania.' This map includes illustrations by H. Warren of Hobart Town, a Tasmania dog and the residence of the Van Diemen Land Company's Agent. The whole has the highly decorative presentation and elaborate border distinctive of Tallis maps. This map was issued as part of the 1851 edition of John Tallis and Company's The Illustrated Atlas, And Modern History of the World. Very good. Minor toning along original centerfold. Blank on verso. Rumsey 0466.056. Phillips (Atlases) 804.